For many years visitors to the Western Wall in Jerusalem were able to climb the earthen ramp up to the Mughrabi Gate and enter the Temple Mount platform. In biblical times the temple of Solomon was located there, then the rebuilt temple of Zerubbabel after the return from Babylonian captivity, and then Herod’s Temple. Today this is where we find the Mosque of Omar (commonly called the Dome of the Rock) and the Al Aska Mosque. 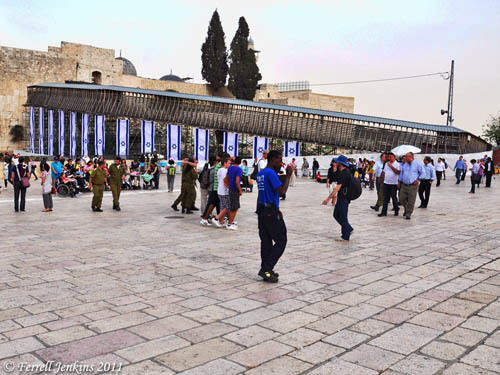 Israel built wooden bridge from the Western Wall Plaza to the Temple Mount platform and excavated the earthen ramp. This has become a controversial diplomatic issue. Itamar Eichner reports in Ynet here. Plans for razing the old Mughrabi Gate bridge, which leads from the Western Wall plaza in Jerusalem to the to the al-Aqsa Mosque and Temple Mount, in favor of a new one have been in the works for a while. According to the report, the bridge was to be torn down next week, but upon signing the final agreement, Israel was stunned to learn that Jordan, along with Egypt, Iraq and Bahrain, filed a complaint against Israel with the United Nations Educational, Scientific and Cultural Organization (UNESCO) over the planned renovations. The motion asks for a UNESCO censure of Israel. Jordan is also demanding that UNESCO order Israel to stop the archeological excavations in the Old City. This photo of the bridge was made in early May. Mughrabi Bridge from the Western Wall Plaza. Photo by Ferrell Jenkins. We know that the level below the bridge, both north and south, is from the first century. Here is the view from the bridge looking down on the former earthen ramp. Excavation (or clean up?) below Mughrabi Gate Bridge. View to the south. Photo by Ferrell Jenkins. I have no specific knowledge about the dating of these ruins, but I would venture to say that they are later than the 7th century A.D. Perhaps a reader can help. Update. After completing this post last evening, I was looking at the Bible Places Blog and noted that Todd Bolen has written about this bridge. He has given links to the background of the controversy and posted some photos. Check here. Ha’aretz has two more articles for those who are interested in the far-reaching repercussions over what happens in Jerusalem. Check here and here. 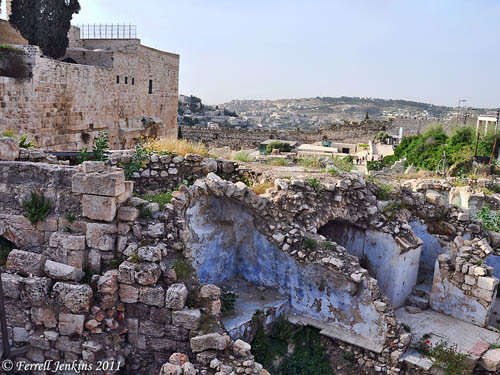 This entry was posted in Archaeology, Bible Places, Bible Study, Israel, Jordan, New Testament, Photography. Bookmark the permalink.